Grimvisions has an interesting take on how to create a cocooned spider victim. 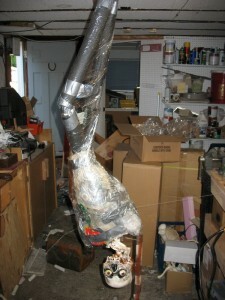 While most tutorials would have you wrap a plastic skeleton or torso, Grimvisions utilizes a pvc frame with newspaper and plastic bags to fill the body. While it may take a little more effort to create your own torso (and let’s be honest, it won’t take that much effort), you’ll feel better knowing that you haven’t wasted a perfectly good skeleton for a prop that would render most of it barely visible anyway.